Bench Dimensions: 52Lx16Wx17H. Bench Seat Dimensions: 16Dx52Wx17H. The lush tropical villas at a French Polynesian eco-resort inspired this contemporary 3 seat bench. Ideal for sipping cocktails at sunset, its teak brown finish, plush beige cushion and brass metal detail create its relaxed modern geometric style. This is a great addition to your home whether in the country side or busy city. Cooper 53 inch Eucalyptus Backless Patio Bench The Amazonia Teak sophisticated line combines quality, style, and comfort. Crafted of high quality teak (Tectona Grandis), this modern furniture collection will make an immediate impact in your patio. 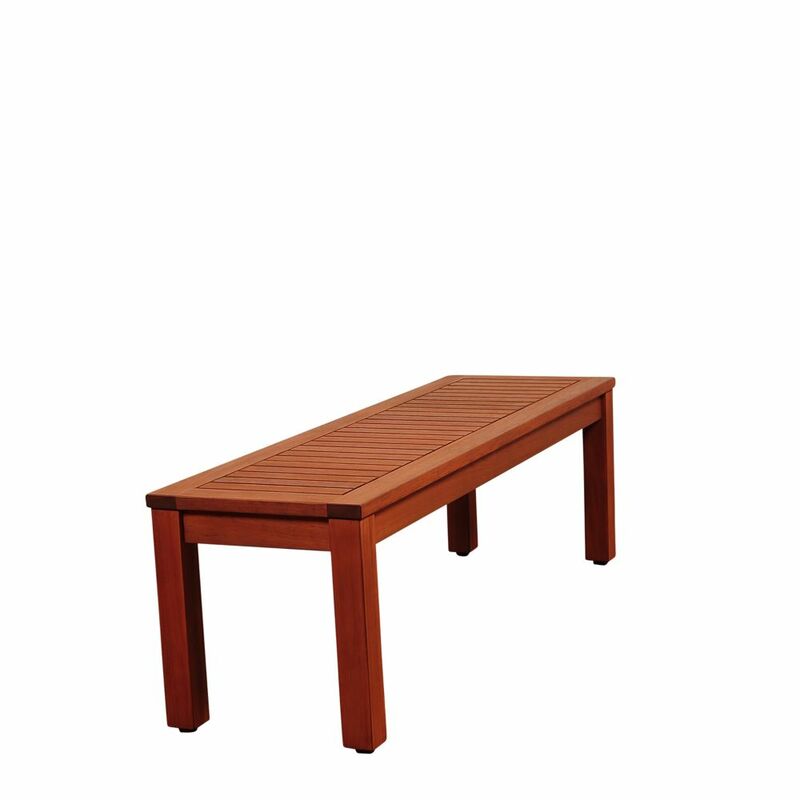 Cooper 53 inch Eucalyptus Backless Patio Bench is rated 4.7 out of 5 by 18. Rated 5 out of 5 by JoeB from Very easy to assemble. Looks great. I am going... Very easy to assemble. Looks great. I am going to buy a second one. Rated 5 out of 5 by LauraE from The bench looks great and is quite sturdy. It... The bench looks great and is quite sturdy. It was not difficult to put together. I plan to leave it outdoors year round (it doesn’t freeze or snow here) and am hoping that it holds up well and continues to look good. Rated 5 out of 5 by srccritic from Excellent quality, sturdy, easy to assemble. Excellent quality, sturdy, easy to assemble. Rated 5 out of 5 by HomeDepotCustomer from Excellent product quality and easy assembly!... Excellent product quality and easy assembly! Rated 5 out of 5 by Satisfied from As expected, sturdy, good looking and very easy assembly. As expected, sturdy, good looking and very easy assembly. Rated 5 out of 5 by dt from Great looking bench for the price. Solid and sturdy. Only take me 10 minutes to install the 4 l... Great looking bench for the price. Solid and sturdy. Only take me 10 minutes to install the 4 legs. Comes with the little wrench to secure the nuts. I used it at front porch for visitors.